Anyway I thought these actions might make me kind of fast at Weeping Willow. I had high hopes for this one. The race started on doubletrack at like a million miles per hour, but whatever, it's a 2 hour race so I'll deal with the poor start position later. I got onto the back of the Thom P - John Burns group and figured that was "good enough." Fifteen minutes in and instead of thinking "ok, I feel good, time to start moving up" I was instead thinking "am I really having this much trouble staying on the wheel of a goofy singlespeeder? Luckily, I flatted at that point to avoid the ignominy of getting dropped by Thom at a later date. How fortunate! 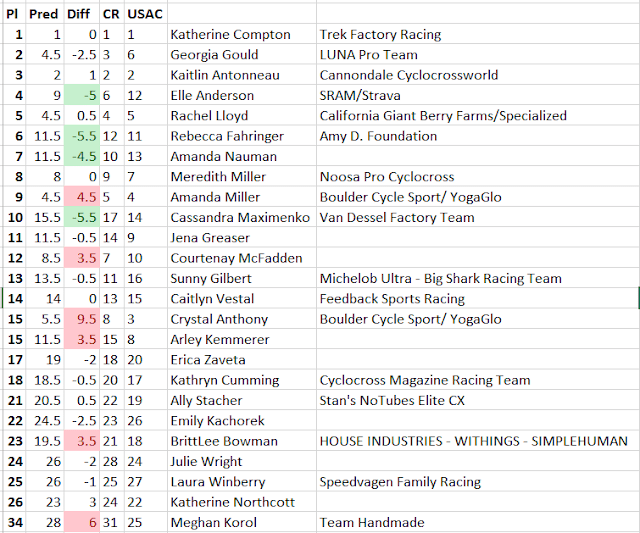 I fixed my flat and jumped back in behind the women's leaders. Crystal and Karen ride FAST and my motivation was low... plus I was doing video for dirtwire... so I figured drafting them to produce dat SWEET FOOTIE made sense. Karen crashed, Crystal attacked, and I spent a surprising amount of time thinking "wow Crystal is pedaling a lot harder than I want to pedal" while I chased her down doubletrack. Coming through the lap zone on the wheel of the pro women's leader did motivate me to get my act back together and start racing my bike instead of creepily stalking girls with a video camera. I dropped Crystal and riding back to my field... and eventually caught up with Jon Anderson, Jay Mueller and a post-flat John Burns. Maybe someone else, too, it's been a while, ok? In any case, right when I was psyched to have a fun and painful last lap with those guys I flatted my OTHER tire, and yeah, I don't have two tubes with me so I guess I'll walk back to my car now. It was easy to explain away my Willow result with the flats, but I knew that my legs were actually crap on that day as well, so I took the week pretty easy and figured I'd do great at the Glocester Grind since I always do well there, because it's flat and technical. Turns out all my good Gloucester Grind results happened on dual suspension bikes, and a 29er hardtail is not a substitute for a dualie when the going gets gnar. And it was SO GNAR. And I should know this. So I left a perfectly functioning 26er dualie (aka the "party bike") in my basement and brought a stupid race bike and it did not go well. Don't get me wrong, you can certainly rock the hardtail on this course if you have core strength and push big gears (like a singlespeedah), and Matty O was 3rd on his Flash, but when you're a mushy spinner wimp like myself it does not work. Thus I rode around for 2 hours thinking about how much I hated everything, and how poorly built/maintained these trails were (rock gardens are fun, mud pits that get bigger every year are not), and I almost threw my bike in the woods about six times. 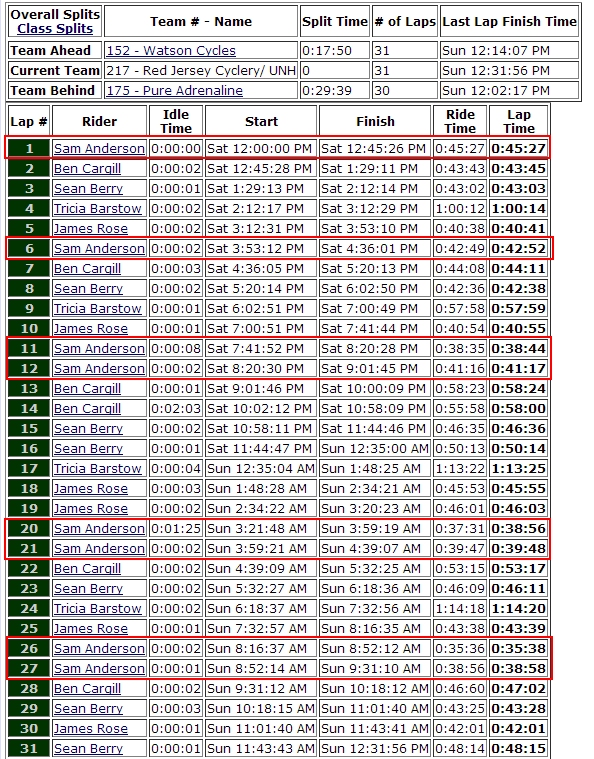 I ended up 11th out of 14 finishers. I think Alby's bike exploded or something so I really only beat 2 dudes. WELL THEN. I take back my previously stated love of the Glocester Grind. Blah. It snowed the weekend before this race, so obviously it was 88 and humid on race day. OBVIOUSLY. Luckily I am a super smaht guy so I knew that pacing is the key to racing in oppressive heat and I CACKLED MANIACALLY when everyone else went super hard at the start. Oh suckas I am gonna catch you up good on lap two! Despite my "strategery" I was still super hot after like 10 minutes. I caught up to some dudes (Pete MacLeod, Jon Anderson) and decided this was the part where I started riding through the field. After "slaying it" for all of 10 minutes, I cracked like an egg, got passed back by both of them, and went into the dark, sad place of being very hot and unmotivated for the next half hour. The lap ends on a downhill so I forgot (briefly) how sad I was and didn't drop out. I also had somehow not been caught by any Cat 1s, so I still clung to some shallow hope that maybe EVERYBODY was wilting in the heat, and plugged away up the climb into lap two. After like five minutes I realized that no, I definitely did still want to drop out, but I didn't feel like backtracking down the trail and having everyone see my shame. So I rode on! The "good" thing about Domnarski is that a lot of the climbs are painful enough that you can't really back off full gas that much (unless you want to walk) so I begrudgingly ended up racing my bike quite hard anyway... and after a while I kind of settled in to "hot day race pace," which was actually a very nice discovery since I am potentially doing the Wilderness 101 on a very hot day in seven weeks' time. At the end of the lap, the leading Cat 1 finally made up the two minutes' head start I had on him, and this spurred me into trying just a wee bit harder. And THIS led to me catching Ben Sawyer with three minutes left to race. 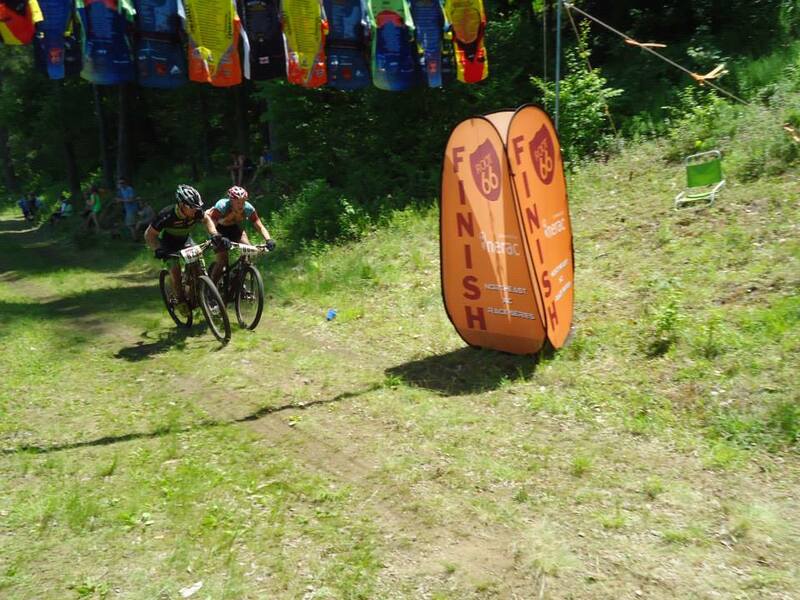 I hoped he would hang his head in the defeat at the sudden appearance of a scrub like me, but instead he became quite combative and we raced our faces off for the last three minutes of the race, which alternate between fast-and-narrow downhill and "burly stream crossing." My hopes of passing in a stream crossing didn't work out (he bobbled, but then so did I) which left me trying to come around him on the 50 yards of flat doubletrack into the finish (through the feed zone, which featured a child looking the wrong way who nearly walked in front of us!). So that was my month. See why I didn't want to talk about it? And I didn't even mention the training crit I got crashed out of! 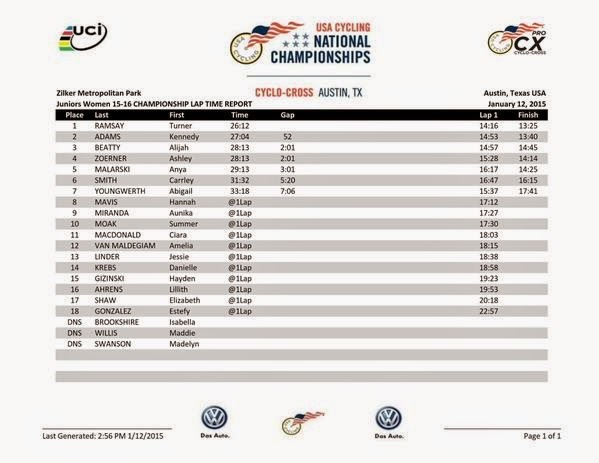 Not exactly dead last and you didn't shear off your derailuer like the 2012 Champ.